They are so hard. 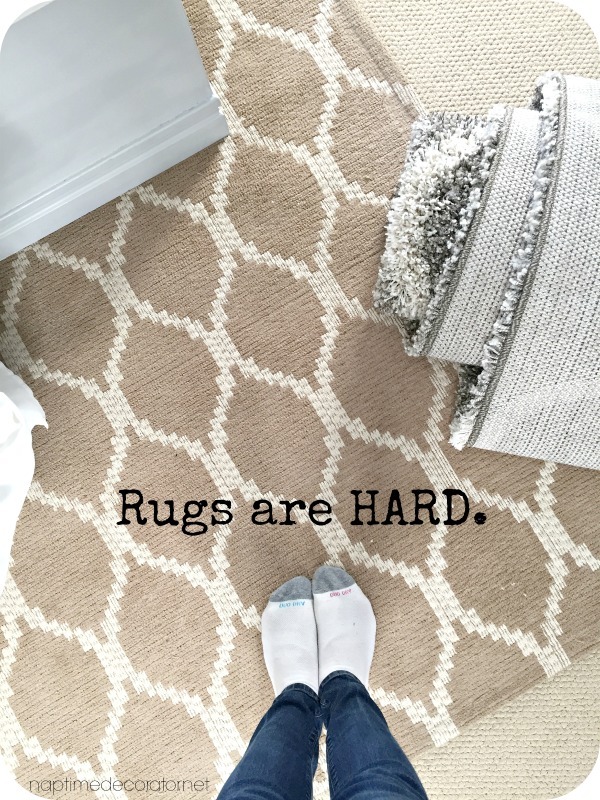 I mean, yes, ironically enough, I did an entire post on how to choose the perfect rug, but sometimes it’s still hard. I guess I should say, to buy rugs online is hard. What a decision! I mean, you can’t really tell what the true color is on the screen (learned that lesson! ), and a big rug is a pain in the you-know-what to have to return, let alone the expense. So when I was faced with the bedroom rug decision last week, I was online for HOURS. Yes, hours. Until I finally found this one that caught my eye. Busy enough, but not too busy. It was called grey but it looked more beige-y in the photos (that’s what I was hoping it would be)…hmmm…AND IT WAS SHAG! I always dreamed of a shag rug in my bedroom. How wonderful to wake up in the morning and have your feet hit something that soft. Days went by as I thought it over. Then out of nowhere, this Target rug appears in my Google search. It wasn’t shag, but it sure was purdy. Oh good grief, Liz, make a decision already! Well, the Target one was on sale AND if it didn’t work out, I can just return it to the store! Perfect. Done. Maybe I made the wrong choice and should’ve gone with that one? Yes, Liz, you definitely should’ve. The Target one is not going to work. I bit the bullet and ordered the shag. At this point, I knew – KNEW – the Target one wasn’t going to be as good. Two days later (WOW, that was fast! ), both rugs got delivered on the same truck! I tore the 8×10 shag grey (but according to the pictures, tannish/beigey – fingers crossed), and got it upstairs in my room. And yay! I liked it! I think!? It was more grey than I wanted, but it could work! And it’s SO SOFT!!! Whew. I’m not going to even bother opening the Target one. Just take that right on over to Target this weekend. Wellll, maybe I should just take a look at it, right? I liked it more! Crapola. The kids and my husband came home, they adored the shaggy grey. I mean, it’s like walking on cotton balls, seriously. And I wanted to love it so much. I kept it under the bed for the day, kept walking in and out of the room, trying to convince myself. Yes, it would work. I tried ignoring the fact that it was too cool for my vision, and that the tan was spot on. I tried convincing myself that the cozy soft factor was amazing, and who wouldn’t want to land their feet on THIS every morning?! I tried convincing myself that even though it was a much cooler rug than I wanted, maybe I could make it work by changing the color scheme a little? I did not want to have to deal with returning this ginormous thing. Until I finally decided I needed to put the tan rug completely under the bed to get the full effect. I mean, that’s the only way I’ll know for sure how I feel about it. So I did. And I knew. I just knew. Immediately. This was the way to go. This was the warm vision I had wanted from the beginning. The way it looks against everything else in the room. It was just…right. 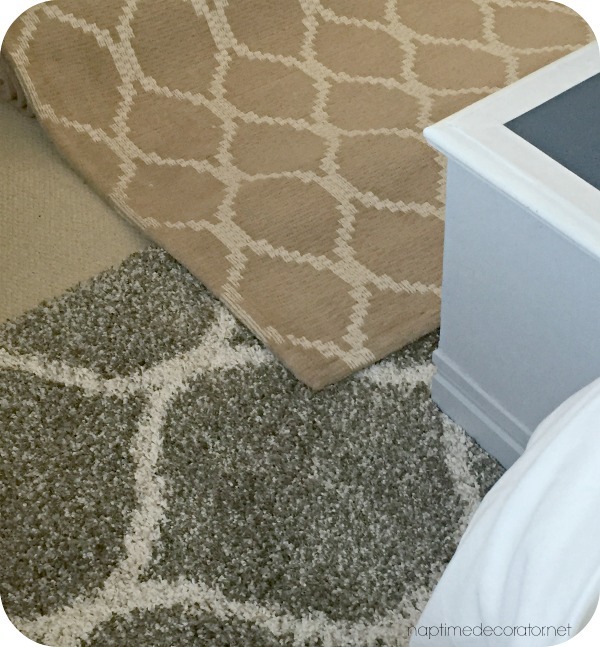 I loved both rugs for different reason – the contrast of the grey was nice, but ironically enough, I liked the subtleness of the tan?! In the end though, I had to go with what my gut was telling me. I couldn’t force that grey rug to work, as hard as I tried. Thank goodness (and major shout-out!) for my friends who wanted it and came by today to buy it from me – they saved the day! So all’s well that end’s well, folks. 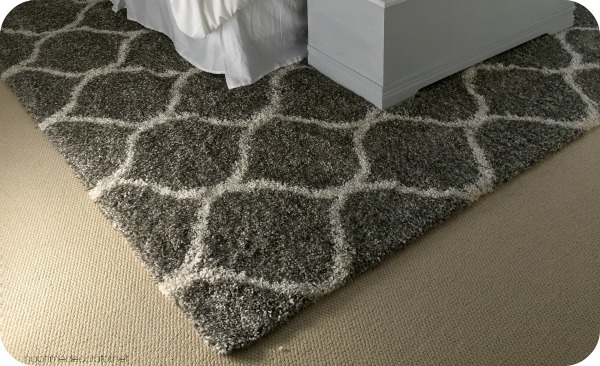 What size rug did you end up getting to fit your king bed?